Rainforest Retreat - ARTE AMAZONIA provides a global voice through art for the indigenous cultures of the Amazon. 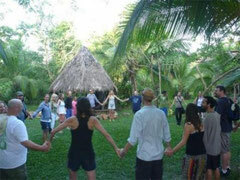 Reality Sandwich invites you to the 2012 Council Gatherings on the Osa Peninsula in Costa Rica being held as fundraisers to preserve rainforest projects spearheaded by the Council for Cultural and Biological Diversity (CCBD). Join us on an unforgettable adventure of self-discovery, wellness and exploration of rainforest plant medicine traditions with time-honored maestros from the Secoya people's community in the Ecuadorian Amazon— gathering in the heart of the Osa Peninsula also known as "The Little Amazon by the Ocean" endorsed by National Geographic as "the most biological intense place on Earth". In this retreat you will be guided into deeper realms of healing and spiritual development, growth and understanding, and to the renewing energies of these powerful times tested spiritual traditions. The retreat will be held in the tropical paradise of Guaria de Osa Ecolodge, a stunning sanctuary of primary rainforest and pristine beaches alongside the Pacific Ocean in Costa Rica, adjacent to Corcovado National Park. Two Council Gatherings will be held--each with a limited number of available spaces. The first takes place January 15-25 with Secoya traditional elders, and Jonathon M. Weisberger, ethnobotanist, founder and steward of Guaria de Osa Ecolodge. The second gathering (Jan. 29-Feb 8) will be hosted by RS's editorial director Daniel Pinchbeck. Both Council Gatherings are blessed with the participation of Secoya traditional elders, who are time honored graduated plant masters and who will be leading intimate ceremonies directly intended towards wellness and renewal of mind body and soul, according to ancient celestial practices. Both retreats are also blessed with the participation of Sarah Chase a New York based acupuncturist who will help participants overcome obstacles in healing facilitating renewal. More information is available below and by clicking here.